* Air conditioned formal carpeted lounge with ceiling fan. 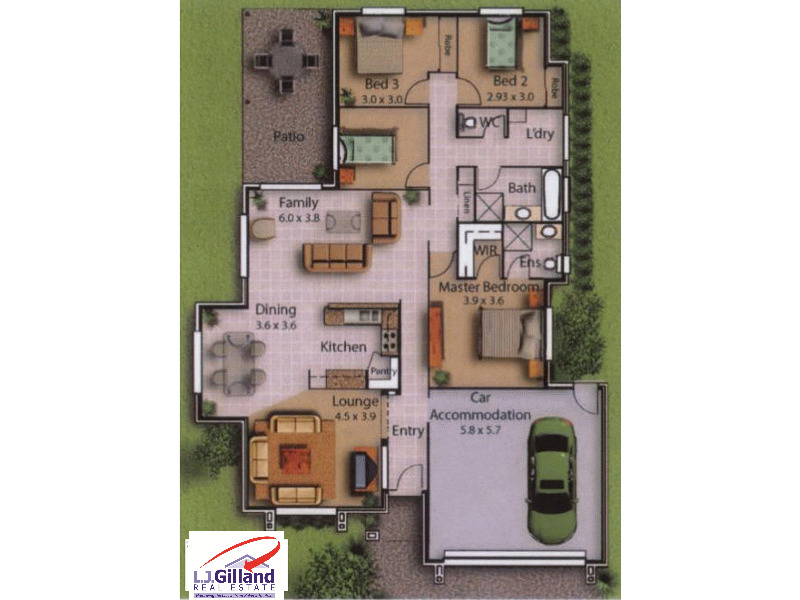 * Open plan tiled family/dining/kitchen area with ceiling fan and sliding door access to pergola area. * Kitchen has plenty of cupboards, pantry, dishwasher and is equipped with all the modern appliances with plenty of bench space for cooking. * Master bedroom is air-conditioned with ensuite and walk in robe. * Other bedrooms are carpeted with built in robes and ceiling fans. * Main bathroom has a separate bath. * Double side gate access. For the homeowner, the property offers attributes and features that make living enjoyable and convenient, and for the astute investor, you have low maintenance tenants that are happy to consider further leases. The house is air-conditioned and ceiling fans are installed to keep it cool in summer. The open plan living area flows seamlessly into the covered alfresco dining area outside. A great place to entertain. This large block has side access to the backyard for a boat or caravan and plenty of room for a shed or a pool. Situated in Bellmere, this is a great home for a large family or a perfect investment in the rising Queensland market. Property currently leased at $350 per week until September 2018, with a great tenant in place. Handy to local shops which include a butcher, takeaway, hairdresser, convenience store and liquor store. Local buses service the area. It’s a 5-minute drive to Caboolture CBD or Morayfield Shopping Centre, medical centre and schools. Motivated sellers are instructing us to sell. Call us now to inspect. Close to a handful of parks, Bellmere’s proximity to Caboolture and Morayfield means a number of quality public and private schools are a short distance away. Similarly, Morayfield Shopping Centre, Caboolture train station and other amenities are also regularly frequented by Bellmere residents. Spacious open plan design with kitchen overlooking the dining and family/lounge room flowing out onto a large outdoor area plus a further separate media room perfectly positioned for a large family. Fully functional kitchen with ample bench and storage cupboards and dishwasher. Large master bedroom with walk in robe and ensuite, while the other 3 bedrooms have built in robes and ceiling fans. This wonderful property is only minutes from Morayfield shopping centre, schools, daycare and transport. Council playground with BBQ and kids playground 100m away. Walking distance to local shops, short drive to Morayfield and Caboolture Train stations and Shopping precincts. Bellmere State school also a short stroll. This is a beautiful well-presented stylish home on a good sized block. day care and transport. Council playground with BBQ and kids playground 100m away. Limited photos supplied due to tenancy privacy.